Home » Self-balancing Scooter » Reviews » Swagtron T3 hoverboard Review – First UL approved hoverboard? Swagtron T3 hoverboard Review – First UL approved hoverboard? The Swagtron T3 is a great ride. The new safety features with Sentry battery shield and fireproof plastic makes it a great choice for the concerned parent. They might have missed out on a few things that could definitely have been improved like the weight limit should have been increased to 65+ lbs. But its a solid and robust hoverboard none the less. 10" RUGGED TIRES - Dual rugged, 10" tubeless tires designed for all terrain exploration. 1 to 2 hour charging time is very efficient compared to other brands. The max load is enough for different weights. Colors to choose from look very vibrant with the finish. It’s got a fair amount of max distance to travel. The smart balancing wheel helps beginners to stand still on the hoverboard without falling. Includes Bluetooth speaker for sound pleasure and LED lights for visibility in the dark. The overall design of the hoverboard makes it safe to use for beginners and especially for celebrities and artists who want to use it for production numbers. It starting to shake below 65 lbs due to wrong tension springs. The plastic over the wheelhouses can easily get damaged and get cracks in it due to bad plastic. If you think the Swagtron T3 might not be the best thing for you then you should check out our review of the Razor hovertrax instead or perhaps some of our other hoverboard reviews. The Swagtron T3 is a hoverboard with Bluetooth that is designed with two things in mind: quality and safety. It is a safe, fun ride that allows any rider to relax and ride with confidence. Built by Swagtron (former Swagway), a leader in self-balancing scooter technology, the T3 provides a superior riding experience, complete with Bluetooth speakers that make this a hoverboard with music. This Swagtron review will outline the new features and benefits that make this hoverboard such a satisfying ride. It was designed to address the safety concerns left in the wake of defects in the wildly popular, but dangerous, hoverboards era of 2015. After the recognition of the widespread safety hazard posed by the combustibility of previous hoverboards, Under Writer’s Laboratory, which represents the leading global safety and quality organization in the world, created rigorous and comprehensive safety and quality guidelines for hoverboards. In the United States, for example, all hoverboards that do not meet the UL 2272 requirements are considered “unsafe.” The Swagtron T3 was the first hoverboard to qualify under these strict new requirements. The Swagtron T3 was forced to pass a battery of tests in order to gain this UL certification. It is the only hoverboard, or self-balancing scooter, with a Sentryshield multi-layer battery that provides advanced protection from fire. This Sentryshield battery actually has its own UL 2272 classification and has passed the Underwriter’s Laboratories rigorous testing. The multi-layer protection means that the battery is actually contained within a case made from aluminum that is fire-proof and damage-proof. In addition, the body of the hoverboard, including the wider, non-slip pedals, is fire-retardant. Consumers may be confident that when riding the Swagtron T3, they will not have to fear the fire danger posed by many hoverboards during 2015. Another thing it has is a “learning mode” that is designed to teach new riders how to safely and securely ride the hoverboard. The build of it is also more durable and operates more smoothly during our riding tests than other hoverboards. The motor propels the hoverboard effortlessly. The stable motor, smooth ride, and “learning mode” ensure that any rider can quickly learn to use it and be comfortable riding it quickly. Swagtron’s focus on providing a comfortable, relaxing, and effortless ride combined with the enhanced safety of the T3 make this hoverboard the ideal gift for any consumer. To outline the basics, the T3 will go a distance of 7-12 miles. It has a maximum speed of eight miles per hour, meaning it’s not the speediest, but with its extensive considerations for safety and quality, its moderate speed is easily outweighed by positives. It has a Sentryshield multi-layer, lithium-ion battery that fully charges in an hour and has a max capacity of 220 lbs. It has a built in carry strap and weighs twenty-two pounds. The dimensions are 3 inches high, 23 inches wide, and 7 inches deep. It ships for free within the United States and the company has consistently speedy delivery. 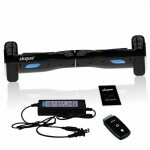 Swagtron also provides a 1 year limited warranty on all its products. Something you’ll find on their best selling Swagtron model the T1. The Swagtron T3 has serviceable quad Bluetooth speakers that may not be surround-sound quality, but do provide music on-the-go and they produce far better sound than most other hoverboards. It is easy to connect to any Bluetooth-ready device, as it is “discoverable” as soon as the hoverboard is turned on. The T3 also has battery life indicator LED lights that clearly allow the rider to know how much battery life is left. It also comes in several colors including White, Black, Red, Blue, Pink, and Gold. Overall, the features to enhance safety, like its multi-layer, fire proof Sentryshield battery, its fire retardant case, and wide, non-slip treads make it a hoverboard any consumer can be confident in buying. Add the solid, quality construction and the relaxing, smooth ride that we just enjoyed, and we have a hoverboard that is fit for anyone to ride. It will make a great purchase even if you are new to the world of self-balancing scooters and haven’t experienced riding one yet, or if you are buying for a younger family member who may not be experienced. This T3 version from Swagtron is the safest and one of the most advanced hoverboards on the market. If you are an advanced hoverboard rider looking for more speed you will have to thumb on the safety which is never a good choice. 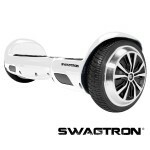 But if you are concerned with quality and safety, the Swagtron T3 is an excellent choice.